Foals are battling it out with Sigrid and Dido for this week’s number one spot on the albums chart. The British rockers are currently at number one at the halfway stage of the charts week with their new album Everything Not Saved Will Be Lost – Part 1, but have the two singer-songwriters hot on their heels, according to the Official Charts Company. 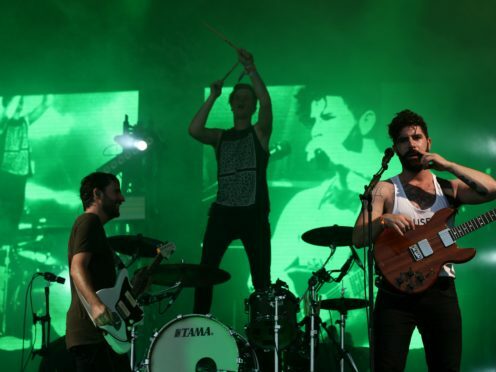 Foals, who have previously scored top 10s with their previous four albums but have not yet topped the charts, are ahead of Sigrid by just under 2,000 combined sales. Norway’s Sigrid, who won the BBC Sound of 2018 prize, is currently in second place on the charts with her debut album Sucker Punch. But Dido is just 136 combined sales behind that with her new record Still On My Mind, her first in six years. Foals are leading the way with more physical sales, while Sigrid is leading on streaming and Dido on downloads, so the number one “could go down the wire”, the Official Charts Company said. Last week’s chart-topper, What A Time To Be Alive by Tom Walker, is currently at fourth place and Psychodrama, the debut album from London-born rapper Dave, is at number five. Other new albums set to debut in the top 40 this week are Paul Weller’s new live album Other Aspects: Live At The Royal Festival Hall, currently at number six, You’re Stronger Than You Know by James Morrison, currently at number 11, and David Gray’s Gold In A Brass Age, currently at number 14. Over on the singles chart, Scottish singer-songwriter Lewis Capaldi is in line for his third week at the top with Someone You Loved. The track is just 200 combined sales behind the current number two, Giant by Calvin Harris and Rag’n’Bone Man. Mabel is currently at number three with Don’t Call Me Up, Ariana Grande is at number four with Break Up With Your Girlfriend, I’m Bored and Sam Smith and Normani’s Dancing With A Stranger at in fifth place. Following the release of his album, rapper Dave has the three highest new entries on the Official Chart Update, with Disaster featuring J Hus at number seven, Streatham at number eight and Location featuring Burna Boy at number 11.